Bill Clinton: Cut defense & ask wealthy Americans to pay their share. George Bush Sr.: Trickle down government doesn't create jobs. Ross Perot: Will balance budget in six years by adding jobs. Bill Clinton: People of all races are equal in the eyes of God. George Bush Sr.: Habeas corpus reform, so you don't have endless appeals. Ross Perot: We have become preoccupied with the rights of the criminal. Bill Clinton: My brother would not be alive today if drugs were legal. George Bush Sr.: I don't believe legalizing narcotics is the answer. Milton Friedman: Legalization resolves drug-related crimes. George Bush Sr.: America 2000: choice of public, private, or religious school. Ross Perot: Raise gas taxes 10 cents a year for 5 years. Bill Clinton: Increase fuel efficiency from 27 mpg to 40 mpg. George Bush Sr.: Onerous environmental regulation will cause job loss. George Bush Sr.: Get deadbeat dads to pay up, to help single moms. Bill Clinton: Should not have tried to reason with Saddam the tyrant. George Bush Sr.: Built consensus with UN to move against Saddam Hussein. Ross Perot: Gulf War did not achieve its objectives. Bill Clinton: End of Cold War brings incredible opportunity for change. George Bush Sr.: Since I became President, 43 countries have gone democratic. Bill Clinton: Don't coddle tyrants in China; they respond when we stand up. Ross Perot: Help former USSR: pennies on the dollar compared to cold war. Ross Perot: Time is on our side in China; many leaders are very old. Bill Clinton: For NAFTA with enforcement and job training. George Bush Sr.: For NAFTA because exports critical to economy. Ross Perot: NAFTA means a giant sucking sound as jobs are lost. Ross Perot: Bad trade deals come from Washington insiders cashing in. Bill Clinton: Opposes Congressional term limits; bad for smaller states. George Bush Sr.: Wants line item veto & individual taxpayer deficit sequester. George Bush Sr.: Limit Congressional terms to 12 years. 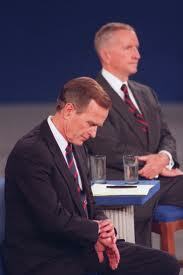 Ross Perot: I have no experience with gridlock; only getting things done. Bill Clinton: National system to check criminal history for gun purchase. Bill Clinton: Managed competition, not socialized medicine. George Bush Sr.: We are taking action on AIDS, despite complaints. George Bush Sr.: Frivolous lawsuits run up medical costs by $25 billion. George Bush Sr.: Important to maintain 150,000 US troops in Europe. Ross Perot: We can only be a superpower if we are an economic superpower. George Bush Sr.: Just a scare tactic that jobs move south due to lower wages. George Bush Sr.: Agenda for American Renewal: jobs program fro small business. Ross Perot: Pledge to focus on the issues, without spin doctors. Bill Clinton: Time for a change from the last 12 years. Ross Perot: Invest Trust Fund surplus like a pension fund. George Bush Sr.: Don't mess with Social Security. Bill Clinton: Raise taxes on income over $200K; reduce taxes under $60K. George Bush Sr.: $150B for transportation infrastructure; a good beginning. Bill Clinton: No troops to Bosnia, but no-fly zone & blockade. George Bush Sr.: No troops in Bosnia, because we haven't defined mission. Ross Perot: No troops to Bosnia until America is more committed. George Bush Sr.: Create enterprise zones, but not via tax increases. The above quotations are from The Clinton-Bush-Perot Presidential Debates, Oct. 1992.